Enjoy a refreshing week on the beautiful island of Mauritius while learning to kitesurf with Mauritius Surf Holidays! In this camp, you will participate in a beginner kitesurf course with professional and qualified instructors from IKO. There is no need to worry about kite, harness, or board since all the equipment is included in your lessons. You will also get an IKO certificate by the end of your course. This is your chance to enjoy the waves and explore the beauty of Mauritius. Surf House Villa d'Or is composed of nine bedrooms, each with its own private bathroom spread into five apartments, equipped with kitchens and balconies facing the sea. You will have your privacy but you will also have the opportunity to share common areas where you will meet new people, share experiences, and spend your time eating, playing, or simply relaxing in the large garden. In the hopefully rare windless or waveless days, you will be able to enjoy the different available activities. You will enter the world of kitesurfing one step at a time, having fun. You will be introduced to the teoretical basis of kitesurfing, and you will acquire some basic practical skills. Gradually, you will learn how to safely control the sail and you will get ready for the first sea trips, which will take place in the following days. Once gained a proper control of the sail, the real fun begins: you get into the water. You will start to ride with the body dragging. Now we start to get serious. You will experience the first departures on the water with the board; then, you will get to actual independent navigation, learning the basic rules of navigation. Access to the course for kids is reserved to age 6-14. We will follow the structure of a basic course, with some adjustments depending on the age. Kids will have a qualified instructor and dedicated materials at their disposal, so to be allowed the necessary conditions to learn and have fun in complete and total safety. The presence of a parent or a guardian is required at least on the first day of course. Surf House Villa d'Or is located in La Gaulette, Mauritius, the closest village to Le Morne and only five minutes from all the kite, windsurf, and surf spots. This solution is perfect for those who want to spend their holidays in Mauritius at an affordable price but without missing anything, not even privacy! 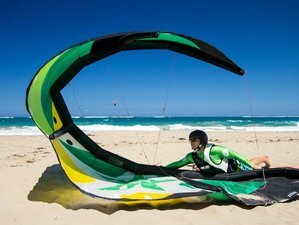 Mauritius Surf Holidays is a kitesurf, windsurf, and surf school which offers not only a service but also a complete journey driven by passion and experience.